When you hear the word 'scribble' what may come to mind is a child, perhaps a toddler or preschooler, a look of focus set in their eyes and yet their marks seem haphazard, disconnected and perhaps even miss the page entirely. First of all, if you have kids, this stage is incredibly important! I have an entire article dedicated to Supportive Scribbling on the Child Development Club Blog. Second, I'm here to tell you that even you - yes you - can reap many a benefit from scribbling as an adult. Just as with scribbling, you may also have a very specific idea of what it means to 'meditate' and today we're going to break out of that box as well. In my own life, sitting in silence and meditating was always an okay engagement for me, but utilizing that same experience through art has been much more powerful. You may be different! Let's find out. I first learned of 'Meditative Drawing' from Dr. Ahmed Kadry, a professor from Egypt. We met in Berlin, Germany at the Arts in Society Conference where we were both presenters in May 2011. Spending just moments with him leading a small group in one of the halls in between presentations was enough to bring about a sense of calm. I felt at ease as well as more engaged in the present moment. Since then I have utilized the basic essence gleaned from him for my students and clients to tap into a similar experience in just minutes. Here's the fun part: It's so easy! 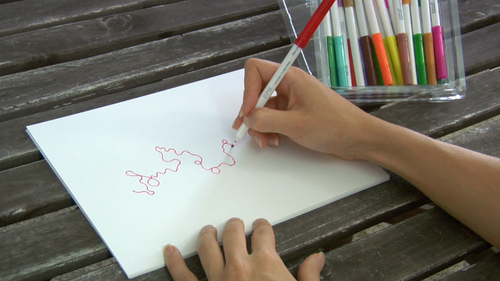 Grab a piece of paper and a writing utensil - something that moves easily across the page. Take a deep breath and press the tip of your pen, pencil or marker to the page. Moving as slowly as you possibly can, gently allow a design to unfold. The key is to focus on your breath and continue to move as slow as possible, keeping your writing utensil connected to the paper. You will end up creating one ongoing line. It may turn or stay straight. The idea is to not think about where it goes but to stay with your breath and your slowed movement as long as you are able. Your mind may wander and your pace may increase, when it does, just take a deep breath and come back to the present moment. Remember to take breaks if you feel tired and even switch colors if you like. Your creation can be continued over multiple sittings. This is a great practice to invite your kids to join in on! With them you can take breaks where you draw like crazy, moving the crayons or markers as fast as you can, and then come back to the slow and steady. Read my Supportive Scribbling article for more suggestions. Go easy on yourself and have fun with this one. Let me know how it goes in the comments and please share any drawings you create!